Polo is perhaps the oldest team sport, although the exact origins of the game are unknown. It was probably first played by nomadic warriors over two thousand years ago but the first recorded tournament was in 600 B.C. (between the Turkomans and the Persians – the Turkomans were victorious). The name is supposed to have originated from the Tibetan “pholo” meaning “ball” or “ballgame”. It is since these origins in Persia that the game has often been associated with the rich and noble of society; the game was played by Kings, Princes and Queens in Persia. Polo has also been linked to the middle and upper classes in the more recent British past, especially with its origins in Britain being with the militia. This is also perhaps due to it being, as a game played on horseback and requiring at least two horses per game, an expensive hobby to maintain. Played on horse back, in the Middle Ages it was used in the training of cavalry across the East (from Japan to Constantinople, and was played almost as a miniature battle. It first became known to western peoples via British tea-planters in Manipur (between Burma and India) and it spread to Malta with soldiers and naval officers. In 1869, the first game in Britain (of “hockey on horseback” as it was referred to at first) was organised on Hounslow Heath by officers stationed at Aldershot, one of whom had read about the game in a magazine. The first official written rules (on which the present international rules are based) were not created until the 19th Century by Irishman Captain John Watson of the British Cavalry 13th Hussars. These were revised in 1874 to create the Hurlingham Rules, restricting the number of players on each team. However, the size of the Polo pitch (nearly 10 acres in area, slightly more than nine football pitches; the largest field in organised sport!) has not altered since one of the first pitches was built, in front of Ali Ghapu Palace in the ancient city of Ispahan (Isfahan, Iran) in the 1500’s. Today it is used as a public park and the original stone goal posts remain. In addition to the vast pitch, an area called the “run off area” is used; incidents within the game that occur within this area are considered as if they happened within the confines of the actual pitch! Polo is simple. Four mounted players make up a team. These players meet on a manicured grass field. The first objective of the game is to hit the ball (made of hard plastic and about 3 ½ inches in diameter) through a set of posts marking a goal 8 yards wide. Players use mallets made of a cane shaft and a wooden head, ranging from 48 to 54 inches long. They must carry these mallets in their right hands—playing left-handed is no longer allowed. The head of the polo mallet is shaped roughly like a cigar. Players hit the ball with the side of the head, not with the end. The play begins with a lineup at the center of the field. One of the two mounted umpires bowls the ball between the two teams. Each team fights to gain possession. Most of the rules in polo come from the concept of the “line-of-the-ball.” The line of the ball is an imaginary line that the ball creates when a player hits it. A simplified explanation of the rules would say that a player must not cross this line if there is another player behind him who is “on the line” and therefore has the “right of way.” This sometimes means that a player must take the ball on the left side (near side) of his horse, and sometimes means he must not try to hit it at all. If a player does “cross the line” or commits another foul such as “high hooking” (hooking another player’s mallet when it is about the level of his shoulder), the umpire blows a whistle. The fouled team then gets to take a penalty shot. The more serious the foul, the closer this shot will be to the fouling player’s goal. A minor foul might merit a hit “from the spot.” If the foul is more serious, or is repeated or deemed to be intentional or dangerous, the umpire might move the ball up to mid-field, to the 60-yard, the 40-yard or the 30-yard line. After each goal, the teams switch directions. If the red teams scores on the east end of the field, then in the next play, red will be trying to score on the west end of the field. Switching directions after each goal equalizes field conditions. However, it can be confusing to players and spectators alike! Most players prefer to have a fresh horse for each chukker. As a rule, a horse can play only one or two chukkers per game. This means that a play must have a minimum of three horses to compete in a match. 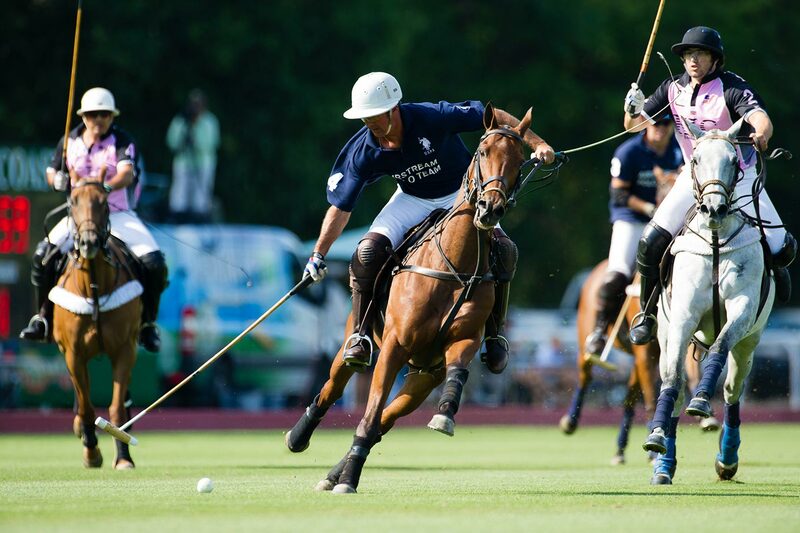 At higher levels, some players use as many as eight horses in a game, jumping off one and onto another mid-chukker. Over the years, polo in the U.S. has evolved from a society sport to include a far broader base of polo enthusiasts – men and women – as well as professional players. The first club in the U.S. was the Westchester Polo Club, formed in 1876. By 1890, there were seven clubs in the U.S.; they formed the Polo Association (today’s USPA) to standardize rules. The number of clubs grew to 12 in one year, and by 1900 there were 23. The Meadow Brook Club in Westbury, N.Y., was the epicenter of the Golden Age of polo and the site of historic matches. World War II diminished the number of players and clubs, but in the 1950s and ‘60s, polo began to grow again. Today, there are more than 275 USPA member clubs with more than 4,500 players.